I just saw this photo on the Yahoo! 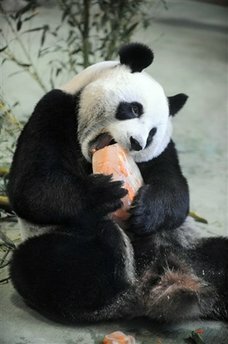 homepage of a panda at a zoo in Taipei, Taiwan eating her birthday cake. Yes, you read that right–birthday cake, not bamboo. I wondered if giving zoo animals birthday cakes was a common practice, and thanks to the powers of Internet search, I can tell you that, yes, it is! 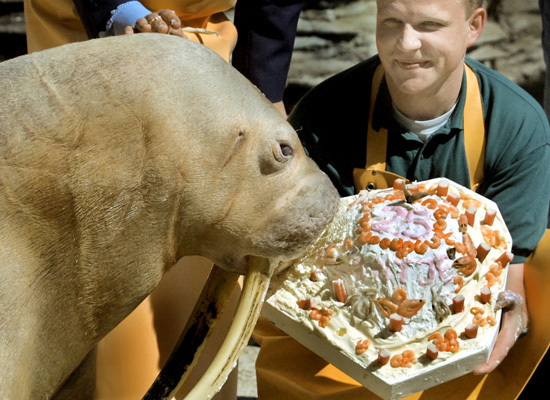 The Huffington Post has a slideshow of a hippo, walrus, cheetah and other assorted animals celebrating another year in captivity with cake (or cake subsitute). Part of me thinks these photos are really cute, but another part of me is screaming, “Why do we do this?” Stop with the anthropomorphism already. It’s a nice photo op and publicity stunt for zoos, but animals don’t care about their birthdays.